We all know that healthy eating and exercise are good for us, but did you know that an Oklahoman is the one who developed that concept? Yes, Oklahoma Hall of Fame Member Dr. Kenneth Cooper pioneered the theory of exercise for good health and coined the term “aerobics,” which has now been translated into more than 40 languages. It’s incredible to think that this concept, which is very much a part of our daily lives (whether we follow it or not), was developed by a fellow Oklahoman and is now accepted worldwide. On September 20th, our Friends of the Medallion enjoyed a special event featuring Dr. Cooper as the speaker. 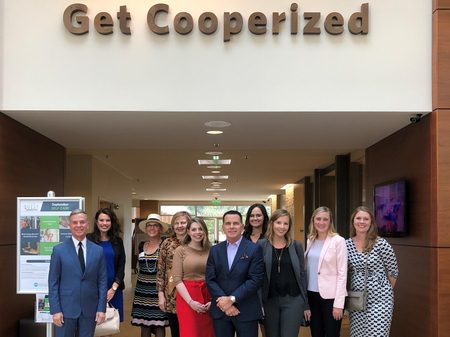 We met at Cooper Hotel and were able to see his vision in action through the Cooper Institute, a research facility, Cooper Clinic, where people from across the country receive yearly preventive exams, Cooper Fitness Center, and more. Dr. Cooper shared his incredible background with us, which included serving as a physician in the military. He told us of the struggles he had in the early days of his research because his theory of exercising for health was so controversial. It’s hard to imagine the concept was ever questioned, because we now know of the many benefits of exercise. Dr. Cooper has had an incredible life – from training the World Cup Champion Brazilian soccer team in 1970 to creating an annual fitness test for children in PE classes and partnering with the NFL to bring a fitness assessment to more than 1,000 schools. He has even been the physician for sitting U.S. Presidents. 2. Make healthy food choices most of the time. 3. Exercise most days of the week. 4. Take the right supplements for you. 5. Do not use tobacco. 8. Get a regular, comprehensive physical exam. I don’t know about you, but I think I’ll start today! To read the details of Dr. Cooper’s “8 Healthy Steps,” click here: https://www.cooperaerobics.com/Health-Tips/8-Healthy-Steps.aspx. Check out a video of the event here! To find out how you can have these special experiences with Oklahoma Hall of Fame Members and other proud Oklahomans, contact me at bg@oklahomahof.com.